To stained glass artisans everywhere, we are very interested in serving the needs of your industry with Johnson's Pure Solders, Soldering Fluxes and Supplies. Johnson offers very high quality products, competitive prices and fast service! Here are just a few of our finest products for stained glass work; Johnson's IA-423 Tin/Silver/Copper, ternary eutectic, Lead-free Solder, along with a very complete selection of Tin/Lead Solders, Johnson's Soldering Fluid, our Water Removable Soldering Paste, Acid Swabs, Lloyd's No. 6 Soldering Fluid, Crystal Gel Flux, and more. Our Minimum Order is $25.00, plus shipping. We accept American Express, MasterCard and Visa credit cards for your convenience. Read Cole's remarks on Johnson's IA-423 Lead-Free Solder & Water Removable Soldering Paste when used with copper foil technique. Note: We have chosen to display the above artwork by Cole Sonafrank in appreciation for his kind remarks about Johnson's IA-423 Lead Free Solder and Water Removable Soldering Paste. We would also like to acknowledge his fine Web Site with links to hundreds of stained glass studios, artisans and suppliers. 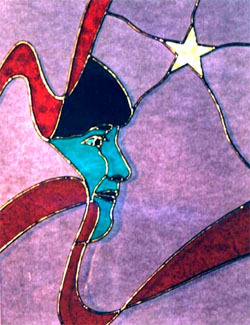 Nowhere on the web have we found a better collection of art and information for the stained glass industry. We think of Sheet Metal Soldering as the soldering of light gauge metals, which covers literally hundreds of different soldering applications used in industry today. Johnson produces the largest selection of industrial soldering fluxes anywhere. We have had the pleasure of working with Revere Copper to determine which soldering flux and lead-free solder were best suited for running long seams on roofing panels. This job requires a solder and flux combination that pulls solder all the way through the joint, yet leaves little or no corrosive residues behind to be of concern later. A consensus was reached after tests showed Johnson's #497 Lead-free Solder, used with Johnson's E-127 Flux-'N-Solder with Pure Tin, enabled mechanics skilled in the art of soldering to perform this task quite successfully. Additional products and panels were then sent to several professional shops for soldering, and we were even more amazed at the results that came back. We are all convinced that conversion to lead-free is possible just as soon as it becomes more prudent to do so. These are among our most notable products for soldering sheet metal are: Johnson's Soldering Fluid, Johnson's No. 1 and Lloyd's Stainless Steel Fluxes, J-33 Flux for Galvanized, B-118 and B-120 Organic Production Fluxes,and Sal-Bars for architectural copper applications. Johnson also produces aluminum fluxes. Refer to our Fluxes page or contact us for help with your flux selection process. We introduced Johnson's Soldering Paste many years ago. It soon became a favorite of plumbers across the country because it offers just the right fluxing power for soldering sweat fittings, but doesn't corrode the copper pipes. Johnson also produces paste fluxes with pure tin, E-127 and E-128 Flux-'N-Solders with Pure Tin, that are compatible with Johnson's Lead-Free Solders, which both flux and pre-tin each joint to provide the tightest and strongest possible bond. A few years ago the CDA, Copper Development Assn. instigated a new flux standard for fire protection sprinkler systems, CDA STM 1.0, then they promoted it to the folks at ASTM where it was adopted as ASTM B-813. Johnson's Water Removable Soldering Paste was developed to meet this new standard and indeed it does; it has been certified by not just one, but two approved, independent testing laboratories. Historically, Johnson Manufacturing Company has supported NARSA, the National Automotive Radiator Service Association, the ACJ, Automotive Cooling Journal, as well as radiator manufacturers and the industry in general. This website offers evidence of our involvement and participation in these efforts. It also provides the most complete reference of all Johnson products, including New Products as quickly as they are developed, HealthWatch articles as quickly as they appear, instant OSHA Safety Data Sheets for every product we make, plus a rapid response time when answering your Emails. Meanwhile, we would like to call your attention to just a few of our product offerings going back as far as 1909; Johnson's Soldering Fluid, Tin-Ezy Powder, Test Tank Powder, Fiberglass Acid Brushes, Johnson's Gasket Tape, SuperBraze, TabTools, Torque Limiters, J-Clamps, Charge Air Cooler Test Set, and WonderBraze. Johnson is pleased to display the following links to these industry sites! Click on any logo to pay a visit, but please remember to come back often.